The Schéma d’aménagement révisé (SAR) is an essential tool for guiding the organization and development of the territory of the MRC de Vaudreuil-Soulanges. It leads the actions of different stakeholders according to governmental guidance and expectations as well as those contained in the Montreal Metropolitan Community’s Plan métropolitaine d’aménagement et de développement. A tool for identifying the schedule, partners, and diverse modalities of completing special projects across the region. Adopted in 2004, the MRC de Vaudreuil-Soulanges’ revised Schéma d’aménagement is divided into many chapters that contain guidance, strategies, and methods for tackling each of these themes. This document imposes regulations in terms of urban planning so that city plans, zoning regulations, housing regulations, and regulations about construction projects and their integration must comply with the Schéma d’aménagement. The MRC de Vaudreuil-Soulanges’ Schéma d’aménagement is currently being revised. 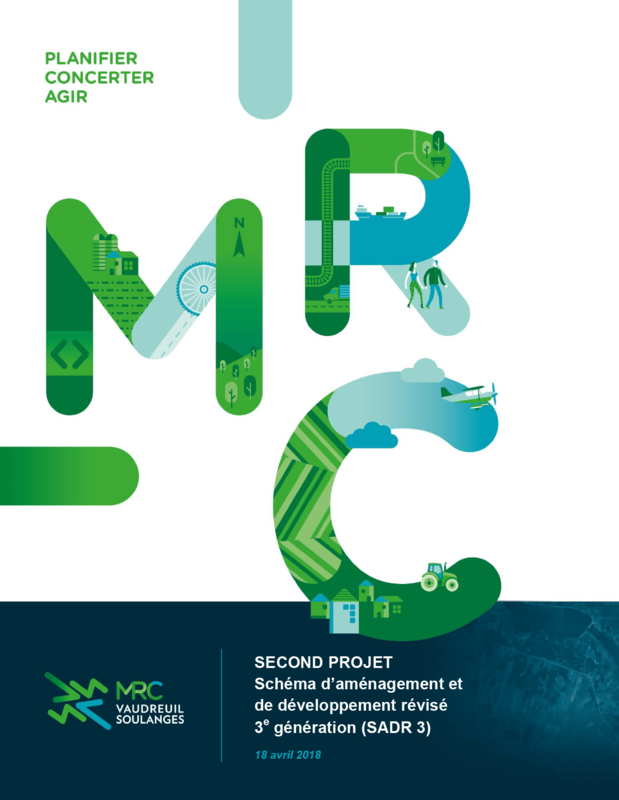 The second version of regulation #232 entitled “Schéma d’aménagement et de développement révisé 3e génération de la MRC de Vaudreuil-Soulanges” is available for your reference. This chapter takes a look at the MRC and where it stands today, notably regarding that which pertains to the territory’s synergy with the Montreal metropolitan region and related concerns, the importance of bodies of water, the limited accessibility to MRC territory, the lack of cultural and hospitality services, the presence of large infrastructure, Mont Rigaud as an exceptional natural attraction, as well as the region’s dynamic agriculture. This chapter presents statistics relating to the population, including average household sizes, age groups, demographic evolution between 1986 and 2001, and the 2016 population projection. This chapter is about the urban zoning districts in each municipality, the municipal services (sewer and aqueduct) that exist, the spaces available for future development, and the expected growth of the population. It also determines the urbanization areas outside of the zoning districts that are not included in the agricultural district (suburban areas and non-agricultural lots). Suggested guidelines: Monetize the existing and future public infrastructures and facilities and avoid urban sprawl in areas located outside of urban zoning districts in order to protect the natural environment and agricultural lands and reduce the costs of services to their minimum. This chapter categorizes agricultural lands by climate, soil type (dynamic sectors with high agricultural potential or viable sectors with a lower potential) or the presence of non-agricultural lots) It also presents the types of crops and the characteristics of farms. 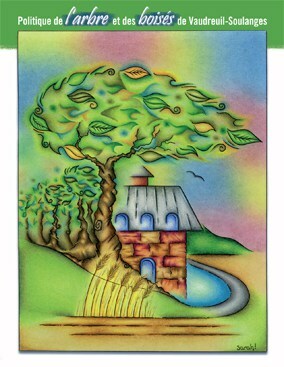 Suggested guidelines: Ensure sustainable development of agriculture in the dynamic sector, while protecting and showcasing the unique qualities of the viable sector and restricting the expansion of non-agricultural lots, as well as regulating existing non-agricultural buildings or buildings not required for agriculture within the agricultural zone, in the context of the preservation of rural landscapes and the revitalization of the rural economy. This chapter shows the characteristics of industrial parks and districts, especially their locations, total surface area, and available spaces. Suggested guidelines: Adopt an industrial policy centered around sustainable economic development and manage the establishment of transportation companies and transfers by promoting the establishment of companies that add value with their activities. The development of the industrial hubs of Vaudreuil-Dorion and Coteau-du-Lac must be prioritized by type of industry. This chapter characterizes the situation of businesses and services in the MRC’s territory, including the location of important concentrations in L’Île-Perrot, Pincourt, and Vaudreuil-Dorion. Suggested guidelines: Reinforce main traffic routes and existing commercial centers in a way that increases the diversity and attraction of businesses, and consolidates commercial hubs and existing services by prioritizing the establishment of large-scale businesses, major educational, cultural, and health institutions, and governmental services. Known for being the dominant feature of the MRC’s landscape, Mont Rigaud is a theme covered in its own chapter. Suggested guidelines: Protect the natural countrysides and ensure balance between the protection of the environment and economic development, all while acknowledging that the mountain is a major ecological resource in the territory. This chapter creates guidelines aimed at providing a framework for developing the regional park and its surroundings in preparation for the improvement project and establishes its position as a space with high recreational, touristic, economic, and historical potential. This chapter deals with certain environmental concerns including the protection of the shores and coasts, the control of quarry pit expansion, and waste management. In this chapter, transportation is addressed by category: roadway, public transportation, railway, water, ferry, off-road, and air, as well as the negative effects resulting thereof (problems of interrupted routes, traffic, noise, signage, etc.). This theme aligns with the Quebec Ministry of Transport guidelines in order to develop a network of functional roads, improve quality of life, security, and environmental quality along the highway system, promote development of public transport, and ensure the integration of municipal infrastructure in the suburban train network. This chapter relates to the theme of heritage, including natural heritage, scenic areas, cultural heritage, and archaeological heritage. This chapter contains a large number of strategies in response to each of the guidelines, according to the type of heritage: protect the natural environment in a way that ensures the best survival conditions for flora and fauna and the maintenance of natural landscapes, protect and improve heritage sites of interest, and bridge the gaps within certain cultural facilities. This chapter deals with recreational tourism in all forms such as cycling, golf, horseback riding, recreational boating, fishing, the outdoors, cultural attractions, agricultural tourism, lodging, and dining. Suggested guidelines: Improve existing recreational tourism products, while emphasizing the development of the Canal de Soulanges Regional Park and trails for riding and cycling. This chapter discusses natural and man-made constraints including flooded areas, areas at risk of flooding, areas at risk of landslides, contaminated land, waste, snow deposition, and more. Suggested guidelines: Ensure public safety and safety of property within the zones that have these living constraints and ensure that new sources of risks or damages do not converge upon vulnerable areas, and also that vulnerable areasdo not come converge upon these constraints. The chapter enumerates the major networks found in the territory. These guidelines consist of assuring the integration of transportation infrastructures in the territory, particularly in the Canal de Soulanges Regional Park, approving Hydro-Quebec energy lines in all designated zones, while considering the legal rules in certain zones, and limiting the building of new telecommunications towers. The spatial organization concept represents in a schematic way the main territorial components that are the foundations for planning, responding to challenges, guidelines, and development and planning goals, as well as to the connections that exist between them. The concept is formed around urban zones, village agglomerations, the agricultural sphere, major heritage and recreational tourism zones (Mont Rigaud), bodies of water, as well as structural lines and links (roadways, railways, the Route Verte, and the Blue Line). This chapter indicates the dominant elements of different functions which will be established in the MRC’s territory. Specific uses are planned for each allocation zone. Many categories of allocation zones are present in the territory, including urban zones, suburban zones (residential, commercial, or industrial), industrial zones, recreation zones, vacation zones, agricultural zones, the zones of Mont Rigaud, the zones of the Canal de Soulanges Regional Park, agricultural-equestrian zones, conservation zones, public zones, and industrial or complex intermodal zones. This chapter shows the approximate costs of proposed intermunicipal infrastructures and facilities. This chapter concretely transforms the guidelines and strategies from the planning outline into steps to execute by identifying the associated partners, the scale, and planned ways to promote the coordination of activities. The last chapter establishes rules and norms to follow according to the municipalities’ urban planning regulations, as justified by the planning interventions of the outline. Encourage the improvement of forests and promote good forest management and forestry practices. Sustainable forest management involves considering the forest as an ecosystem where a variety of components interact with each other. Therefore, the forest generates and influences several resources including wood, wildlife and their habitat, water, sun, and scenery. In Montérégie, many MRCs have been adopting logging regulations since 1998. Black ice and new trends towards liquid manure spreading in agricultural environments are factors that accelerate deforestation, as demonstrated by three studies completed since 2002 that covered the Monteregian territory. These assessments also apply to the MRC de Vaudreuil-Soulanges. Furthermore, in addition to the agricultural context, the MRC is facing accelerated development of its infrastructures and urbanization. The natural environments of the eastern portion of the territory, being in a high-development zone of the Montreal region, are more subject to this type of pressure. In this context, the MRC de Vaudreuil-Soulanges is proposing measures for the protection and improvement of woodlands. The Politique de l’arbre et des boisés was written as part of this proactive step that aims to revitalize regional initiatives in terms of improving natural heritage. The MRC de Vaudreuil-Soulanges created a Plan de développement de la zone agricole for the 23 municipalities in its territory. This planning tool begins by briefly assessing the agricultural situation in the territory, and then proposes concrete interventions that contribute to sustainable development, longevity, and the standing of the MRC’s agricultural activities. 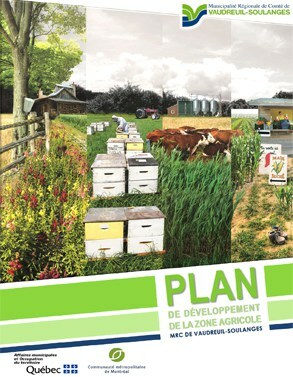 The creation of the Plan de développement de la zone agricole improves understanding of the territory and its agricultural activities, creates a new dynamic between the stakeholders of the area, establishes an appropriate place for conversations about how to define a joint vision for agriculture, and determines the best ways to fully take advantage of the agricultural potential and undertake concrete measures. Encourage development of complimentary activities such as agricultural tourism and on-site food production.